Fabiano Caruana, Shakhriyar Mamedyarov, Vladimir Kramnik, Ding Liren, Vishy Anand, MVL and more stars were rested for Round 1 of the Batumi Olympiad, but it didn’t stop a massacre. The favourites won in all 162 matches in the Open and Women’s sections, with none of them dropping more than a point. Some of those points were dramatic, though, with China’s Li Chao the highest rated casualty as he fell to 464 points lower rated Candidate Master Mohamed-Mehdi Aithmidou from Morocco. 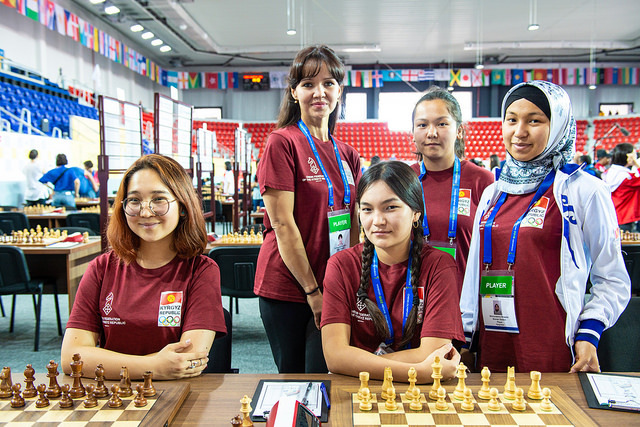 The logistical challenge of the Chess Olympiad, with 1600 players accompanied by captains, coaches and FIDE delegates, means that the first day seldom goes smoothly. 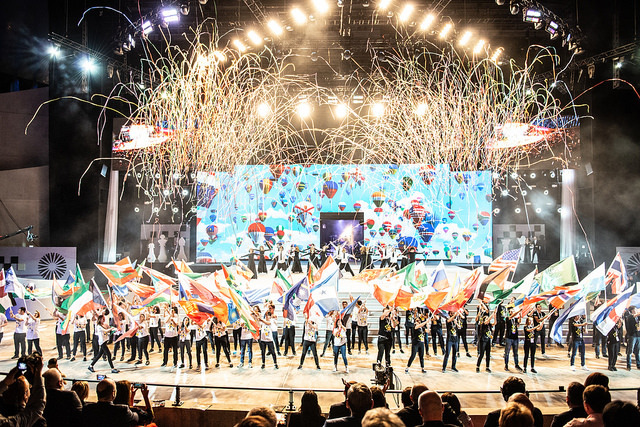 The Batumi Olympiad was no exception, with Round 1 a return to earth after an Opening Ceremony that received universal praise. The playing hall in which our teams were playing, called “playing hall one” which is for the top boards, was quite a disaster. The players are very close to each other, with little room to breathe. The main hall is always extremely crowded, it is noisy and hot. The most dramatic impact was on the tournament’s top seeds, USA, who took almost an hour from arriving at the venue to reaching their boards. If play had started on time they could have forfeited their match, since there’s only a 15-minute grace period for late arrival, but in fact the start of play was delayed until around 15:15. Controversially, when the games did start, the US players were still penalised around 7 minutes on the clock on each board, but this wasn’t a match-up where it was ever likely to matter. Panama qualified for the 2018 Football World Cup at the expense of the US team, but their chess players were mercilessly dispatched 4:0. The prosaic 25…Rxg1+ is also completely winning, but 25…Qe1! was mate-in-3. You can also replay the commentary from IM Sopiko Guramishvili and GM Ivan Sokolov, though on Day 1 the star was Eugenio Torre. Asia’s first grandmaster is now 66, but it’s still a disappointment that he’s captaining rather than playing for the Philippines this time round, since in Baku in 2016 he won an individual bronze medal for a stunning 10/11 that Peter Svidler described as “frankly beyond belief”. He appeared on the live show to talk about his friendship with Bobby Fischer in the years when the 11th World Chess Champion was living in Japan. He revealed that Bobby was seriously considering moving to the Philippines if he hadn’t been given asylum in Iceland. And then he started to sing! 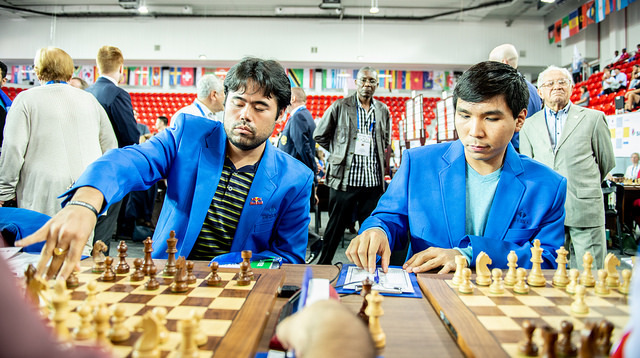 The Netherlands captained by Jan Gustafsson and led by Anish Giri were the first top team to post a 4:0 win, before they were joined by the likes of Israel, Poland, the Czech Republic, Germany, Croatia, Peru, Argentina, Spain and the list goes on. Johan-Sebastian Christiansen helped Norway to a 4:0 win with 25…Qxf4! and White resigned, since 26.Qxf4 runs into 26…Ra1+ 27.Kh2 Bxe5 and Black wins a piece. It wasn’t all plain sailing for the favourites, as various top players were held to draws. For instance, Zambia’s 2393-rated IM Andrew Kayonde held the great Vassily Ivanchuk and 2376-rated IM Igor Yarmonov, playing for the physically disabled team, held 2751-rated Teimour Radjabov. 38.Qe6+! Kh7 39.Rd1! and it’s a simple win for White. Instead after 38.Qe8+ Kh7 39.Qxd7 (39.Rd1 now can be met by 39…Qf5!) 39…Qxd4 White had no more than a draw. The key moment came after 46.Ke3? The king is a powerful piece in the endgame and it’s generally good advice to activate it, but on this occasion the popular Canadian grandmaster had overlooked a sharp tactic: 46…d4+! and if 47.Nxd4 there’s 47…f4+!. The pawn advanced to d3 and soon d2 and Rijendra went on to win a fine game in 87 moves. The other games went the same way until Montenegro wrapped up a very quick 4:0 victory over Gambia in that match. It was, however, a day on which we learnt not to underestimate players rated below 2000. Russia’s Aleksandra Goryachkina (2535), on top board for the top seeds, had a lost position against 1943-rated WIM Maria Rodriguez from Costa Rica, although in the end she scraped a draw. It’s move 100, and Rozana could have wrapped things up with 100…Qe8#. Instead, after 48 seconds, she went for 100…Qc5+. There was no harm done, and Sophie didn’t test her opponent again when she resigned a move away from mate on move 106. 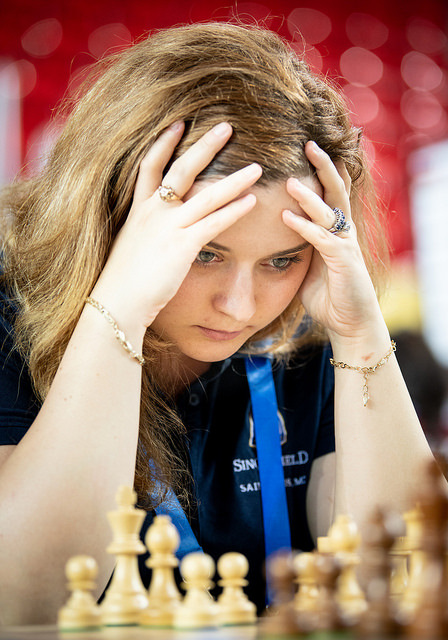 1809-rated WFM Andreina Quevedo from Uruguay also beat a champion, 2017 US Women’s Chess Champion Sabina-Francesca Foisor, when the US star’s central break backfired spectacularly, while Guatemala’s 1922-rated WIM Silva Carolina Mazariegos beat Polish Women’s Championship runner-up Anna Warakomska. 30.Rxe6! Qxe6 31.Nc5, and, after one more mistake, White was winning, with Roza converting with aplomb. One noteworthy result in the women’s section was Humpy Koneru’s win over Helen Milligan in India’s 4:0 victory over New Zealand – not for the result itself, but since it was Humpy’s first classical game back after a 2-year hiatus from chess. As an inactive player she’d fallen off the official rating lists, but if they were updated today she’d be the women’s no. 3.